Yesterday demonstrations took place in Birmingham city centre as part of a national day of action called by UK Uncut and Boycott Workfare. Starbucks on Colmore Row and New Street were occupied in protest at tax avoidance which costs us £25bn each year, whilst Argos, Superdrug, Poundland and McDonalds were visited by people demonstrating against the use of forced unpaid workfare labour by these companies, and the work programme which reduces your chances of finding work. 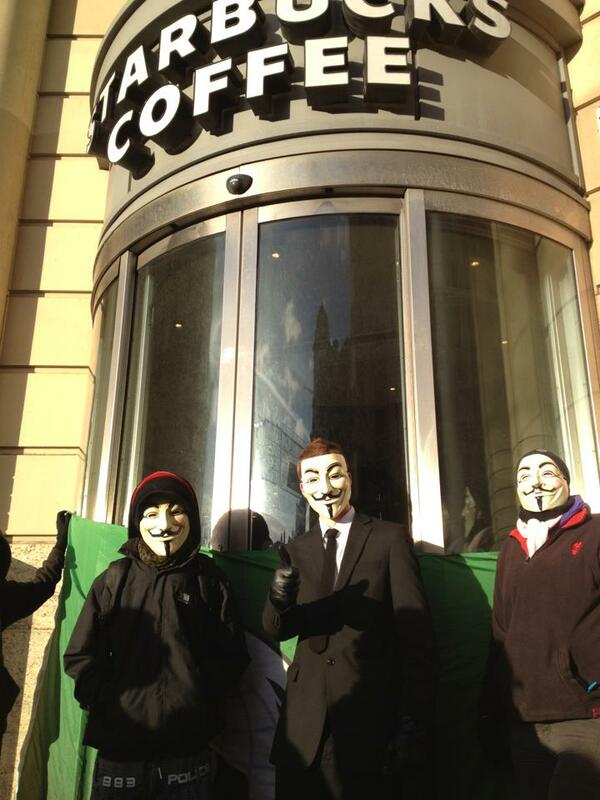 Students at the University of Birmingham, along with members of the public, young and old, decided to embarrass Ian Cranna – Starbucks VP for marketing – yesterday by awarding him a golden mug before his speech. The mug was awarded for the company’s ‘mugging’ of the UK taxpayer. The VP Marketing was speaking at the University of Birmingham Business School as an engineering alumni – students wondered why someone from this particular company was invited to talk. Cash tills were ringing, snow falling down. For it’s the busiest shopping day of the season. UK Uncut know you’ve been naughty this year. Whilst the undeserving rich will be patting themselves on the back and awarding themselves huge Christmas bonuses, there are many people who will be struggling this season. And they’re not asking for much. Some pensioners will be wishing their Winter Fuel Allowance hadn’t been cut so they didn’t have to go cold. Many parents will wish their local Sure Start centre was still open so they had someone to look after the kids. Many disabled people will be wishing their welfare payments hadn’t been decimated so they could still make ends meet. These wishes and many more could easily be granted if the government abandoned its brutal cuts agenda and instead made rich tax dodgers and banks pay what they owe. On December 17th, with only seven shopping days til Christmas, join UK Uncut’s shut-down santas and occupy elves as we hit the Christmas high streets and make sure that a company that has been naughty goes without this year. Via the Facebook poll, we’re going to decide together which high street target we should shut down. The company that wins the most votes online will be crowned UK Uncut’s Christmas Turkey and will be in for a roasting on December 17th. Which tax-avoiding Scrooge or big-banking Grinch will you choose? There’s a selection box of high street stores, hoping for huge sales this Christmas, who’ve been very bad. This year Vodafone paid a £6bn dividend to its shareholders, whilst still refusing to pay us the £6bn tax it owes us. Topshop, Dorothy Perkins and Miss Selfriges are all part of Sir Philip Green’s fashion empire Arcadia, but whilst they sell Christmas presents on our high streets, the profits go to Monaco. Boots dodged another year of tax by keeping their headquarters registered to a post box in Switzerland. And then there’s the big banks. Not only do banks like Barclays continue to receive huge taxpayer subsidies, but they also use tax havens to avoid paying their fair share back to society. We won’t know the winner until a couple of days before the 17th, but it’s already time to think about how you’re going to shut down your local branch. Wish your Sure Start centre hadn’t closed? Grab the kids and turn the store into a Christmas creche. Wish your leisuire centre was still open? Hold a festive aerobics class. If your only Christmas wish is to see your local Women’s Resource Centre reopened, then tell the Government by reinstating it again in the chosen tax dodger or bank just down the road. Birmingham will take join in this day of action. Meet at 2pm outside Moor Street Train Station. You could dress up in Christmas costume with presents to represent public services, or not dressup and be a hard working taxpayer who receives the presents.. but watch out for the tax dodgers, waiting to steal them from you! Ho ho ho! Don’t forget to vote, and see you on the high streets!